Calling all Third St. alumni! 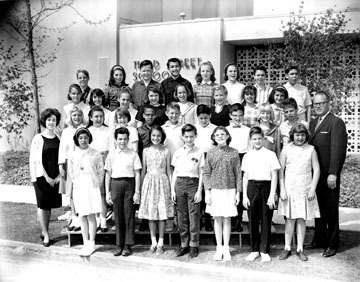 SIXTH GRADERS pose for a class photo in 1964. If you recognize these students, or if one of them is you, let us know. Hard to believe, but Third Street Elementary School is celebrating its 90-year anniversary in 2014. The 90th Anniversary Committee is reaching out to all alumni to help organize the big on-campus celebration on May 17, 2014. Some activities for the event, which is in the planning stages, include classroom themes by decades, a presentation of the school’s first “Distinguished Alumni Award,” tours of the school campus and musical performances by current Third Street students, and much more. Alumni can help make this event a success in several ways: by reaching out and spreading the word to their former Third Street classmates, by helping the anniversary committee organize elements of the event and by supporting the alumni giving fund. Additionally, if any alumni have old photos, newsletters, projects or other artifacts from their time at Third Street, the school would like to share them at the event so current and future students can learn more about the history of their alma mater. For more information, visit friendsofthird.org/alumni or alumni@thirdstreetschool.com.